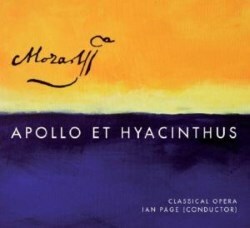 Before they moved across to Signum, Ian Page and Classical Opera's series of Mozart operas began on the Linn label. It's fitting that they began at the beginning with Apollo et Hyacinthus, Mozart's first opera. Die Schuldigkeit des Ersten Gebots, while it predated Apollo, doesn’t quite count as an opera because it’s a “sacred Singspiel” and, anyway, it’s incomplete. Apollo et Hyacinthus was commissioned in 1767, when Mozart was 11 years old, by the grammar school attached to Salzburg University. This helps to explain why the text is in Latin. It was, in fact, intended to be interpolated within a high-minded Latin tragedy that would be performed by the students at the Gymnasium, and which dealt with similar themes of friendship, loss and clemency. Only one part is written for a broken voice, and the others would have been taken by boys at the school, none of whom were much older than the composer. It's an unavoidable piece if this cycle of operas is to be truly complete, but under Ian Page's direction it is never a mere duty. Instead he brings the piece to vibrant life with the joy of a new discovery and he energises it with his own directorial passion for the project. The overall impact is of a musical discovery that will delight any Mozartian. While we're a long way from the later masterpieces, there is an enormous amount of beauty and craftsmanship to enjoy, and Page unfurls it before our ears with the skill of someone for whom this is a labour of love. You get that right from the beginning, with a beautiful lightness to the orchestral palette, as the strings dance through the overture with winds and horns commenting on it delicately as they go. It's testimony to Page's determination to treat this work on its own terms, rather than to surround it with false portentousness or to pretend that it is of the stature of the later operas. That said, there is some remarkably high quality music on offer here, and if you try hard enough then you can hear anticipations of later operatic treasures. Try, for example, the duet Discede crudelis, with its buzzing strings that whizz up and down around the voices, or the muted strings for Oebalus' and Melia's duet, which aren't a million miles away from the world of Barbarina's lost pin. Page has also done a remarkable job in assembling a pretty big name cast for what many might dismiss as a minor project. Sophie Bevan crowns the singing cast as Hyacinthus. Her aria is sung with beautiful tone, and she does a predictably excellent job of navigating its various emotions. Lawrence Zazzo treats the part of Apollo with admirable seriousness, toning down the extremities that can intrude into some of his performances of other roles, and singing his aria with steadiness and clear beauty. Andrew Kennedy's warm lyric tenor is an ever-welcome presence, and Klara Ek's brilliant, clear-as-a-bell soprano is a real delight, and brings a proper touch of class to the sprightly coloratura of Laetari, iocari. Christopher Ainslie is perfectly acceptable as Zephyrus, though his counter-tenor is rather put in the shade next to Zazzo's. All of the singers apply themselves with seriousness and openness to the recitatives, which are also ably propelled by the unobtrusive continuo players. The recorded sound is also first class; they even go the extra mile in providing sound-effects for the storm that hits the altar in the Prologue. It is, therefore, hard to imagine more auspicious circumstances in which to discover Mozart's first opera, and it's a capital way for Page and Classical Opera to have started their Mozart cycle. Try it before going on to Schuldigkeit, Mitridate and Re Pastore.